Polar bears recently dominated the news cycle after a proposal to ban international trade in polar bear parts was rejected at a major conference on wildlife trade. The plight of the polar bears has become increasingly pressing with the rapid melting of sea ice and other impacts of global warming. For most, the polar bear remains a symbol of the wild Arctic. The bears are renowned for their ferocious strength, their independence, their predatory ways. They represent the vast wilderness and are a tangible example of the impacts of global warming. They are also in our backyard. And by “our backyard,” we mean the wild and remote places where we maintain logistics hubs and where we help scientists access the Arctic to conduct important research. 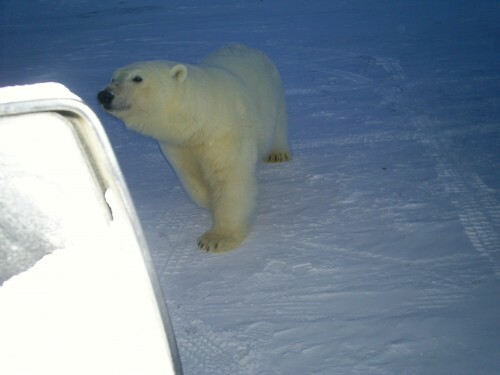 Years ago, Les Copeland, one of the Polar Field Services maintenance managers at Alaska’s Toolik Field Station, had a close encounter with polar bears—to say the least. I was in Point Lay, a little village on the north west coast of Alaska. A whale carcass had washed up on the beach. That's what attracted the bears. They can smell meat up to 50 miles away. And for dessert...a truck bumper. You can also see that they all get along when there's plenty of food. Normally they are loners. [A man standing nearby] was a professional photographer. That bear started coming at him and he couldn't get the camera off the tripod and he wouldn't leave it there. I thought the bear was going to get him but he finally got the camera off and got inside a truck. In my opinion that was what's called a close call. I was in the village for an extended stay to rebuild two Caterpiller engines on their generators at the power plant. Another picture shows a bear trying to eat the headlight of our Ford ranger. I guess glass is part of a balanced diet. I really believe that I was smiled upon that day. How many people can claim that they saw this in real life?? I also talked with an old white man who passed through there. He was walking to the next village on the map. Then the next one and so on. I asked him if he had a gun with him and he said, "No." When I asked him why his response was that he was going to leave a story behind that his grandkids could talk about. i.e., "Grandpa was eaten by a bear." 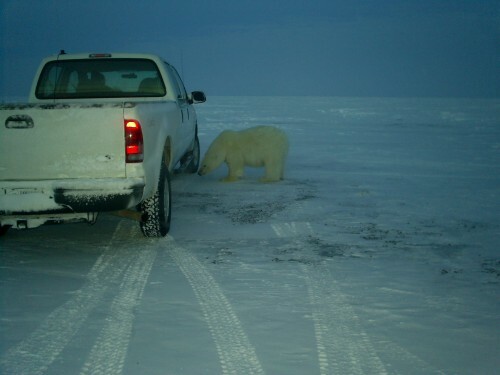 Understatement of the year: a close call with a polar bear. There's nothing preventing them to swipe at us and knock us down but then again they said there was no guarantees, just a small chance. I met a teenage girl there. When her mother was pregnant with her she was walking outside with her boyfriend when they were attacked by a Polar Bear. The man wrestled with the bear and told her to run. When they found his body several miles away it was missing 45 lbs. of meat. I met the girl whose father gave his life to save a daughter he hadn't met yet. It was so sad but it should never be forgotten. 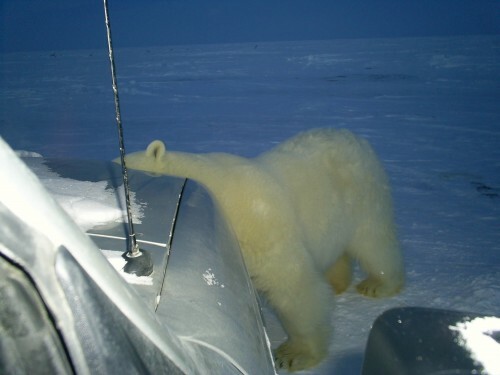 Les' new employer, Polar Field Services, has spent significant time developing training materials and a guide to avoid and mitigate the risk of polar bear interactions. We noted that Les' remarkable story provides useful examples of situations people should avoid--and the dire consequences of not doing so.